Here you will find 25 Days of Christmas Activities that are simple enough to accomplish during the holiday rush, and will provide you and your family with memories for years to come. Then the month of December starts. The calendar gets fuller by the minute and I can count on one hand the number of meaningful 25 Days of Christmas Activities my kids and I experienced together in the midst of the crazy. So I thought, this year, why not plan ahead? 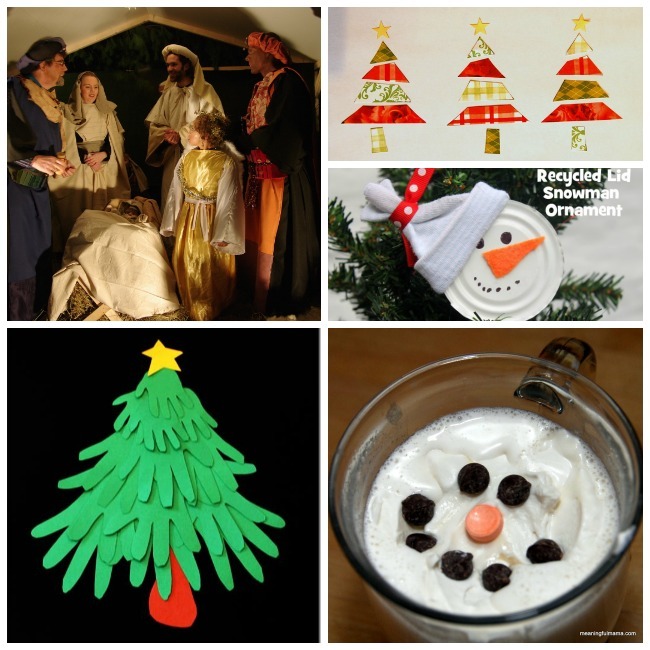 I hope you will find everything you need here, but if not, here are 75 other Christmas Activities for Kids to choose from! Day 1: Make an Advent Countdown For your kinesthetic learners, how about this ping pong ball and toilet paper tube advent calendar by Kids Activities Blog? Or simply craft a red and green paper chain, complete with 25 links that the children can tear off each morning in anticipation of Christmas day? Day 2: Craft your Advent Wreath Focusing your hearts together as a family on a weekly basis on the coming birth of Christ can add rich depth and meaning to your holiday season. This Mason Jar Advent “Wreath” by Meaningful Mama is simple to put together but will reap beautiful rewards. Day 3: Who will we bless? 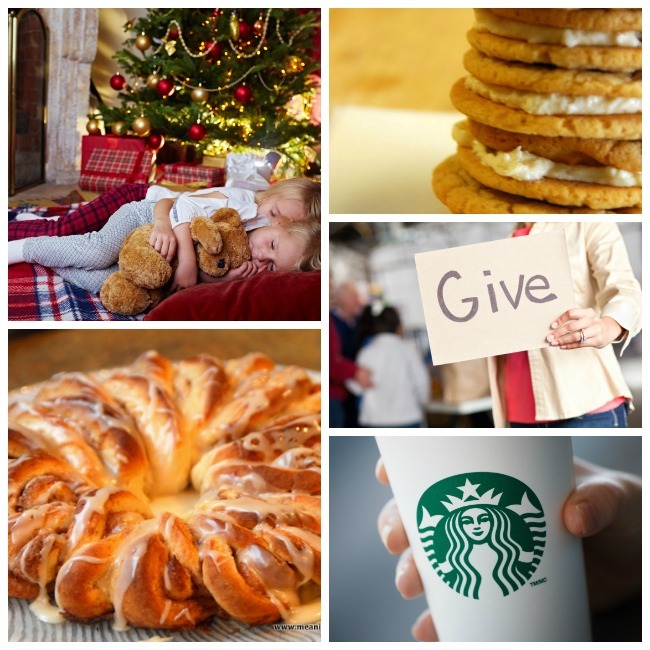 Brainstorm with your kids the special people they would like to bless this holiday season. Think teachers, neighbors, church leaders and special friends who maybe live at a distance. Encourage them to think out of the box… maybe there is someone down the street that they don’t see very much but you know has fallen on hard times? Or there is a particular child in their class that doesn’t have many friends? Hang the list somewhere you can all see it, and let your kids know throughout the advent season you will be making special crafts and goodies they can use to wish the special people a happy holiday season. Day 4: Candy Cane Science Who doesn’t love candy canes? 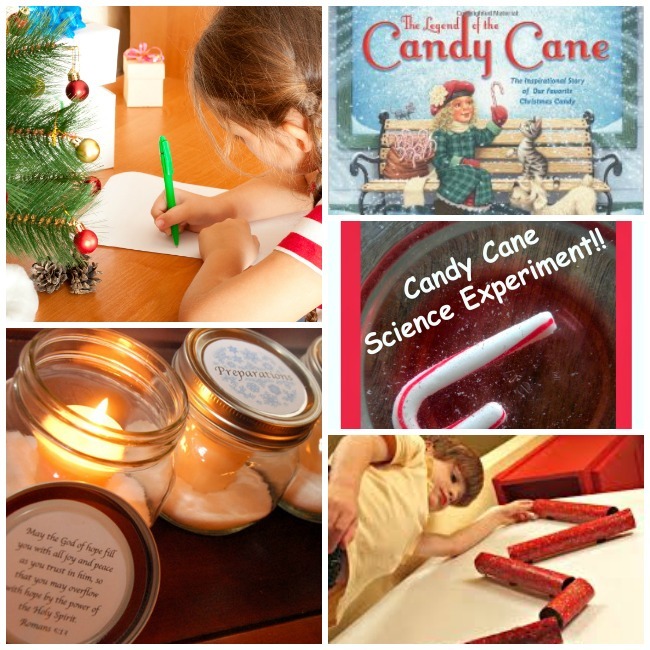 Take this seasonal candy and learn more about the properties of sugar and water in this easy to follow Candy Cane Experiment by Preschool Powol Packets. Day 5: The Meaning of the Candy Cane Hopefully, you still have some candy canes leftover from yesterday’s experiment. As a family, enjoy sampling the candy canes together while you read The Legend of the Candy Cane (amazon link provided). Day 6: Visit a Live Nativity A simple google search for your area should point you towards a Live Nativity! This is a great way to bring the events of Christ’s birth to life for our kids. Our children look forward to this tradition every year. Day 7: Make a Family Handprint Christmas Tree Mama Smiles shares a simple handprint Christmas tree craft that can be repeated year after year to gauge and celebrate our kids’ growth! Make two and send one to Grandma. Day 8: Snowman Crafts Snowmen are iconic and whimsical. Celebrate the snowman indoors with this Olaf the Snowman made from marshmallows or this adorable Snowman Ornament by Inspired by Family Mag. Day 9: Hot cocoa for breakfast In our home, hot cocoa is a treat, not a given! Surprise your kids this morning with hot cocoa as they stubble downstairs. Let them top theirs with marshmallows from yesterday’s craft, or try something new with one of these 20 Yummy Hot Chocolate Recipes! Day 10: Compassionate Christmas Cards It’s time to make some homemade cards! Set out the markers, glue sticks, glitter, stickers and blank paper, and let the kids’ imaginations take over. Or, provide a little more direction and try these Christmas tree cards by Meaningful Mama. Select recipients from your blessings list and talk to the kids about how meaningful a card in the mail can be! Day 11: Make a Plant Pot Check your blessing list and decide who needs a beautiful, handmade potted plant. Here Comes the Girls shares a lovely tutorial for a child crafted potted plant. After the creation is complete, hand deliver the gift as a family to the chosen recipient. Day 12: Surprise Christmas Light Trip Have Daddy tuck the kids into bed while you (sneakily) prepare hot cocoa in travel mugs. Run the mugs and cozy blankets out to the car and then dash up the stairs to the kids’ rooms. Open their doors and shout SURPRISE!!!! Get them out of bed and go on a hunt around your neighborhood (in jammies!) for the best and brightest Christmas light displays. The kids will love the element of surprise and the hot cocoa! Day 13: Make Christmas Wrapping Paper Do some DIY wrapping paper for all your special gifts this season. Brown packaging paper can be dressed up with festive rubber stamps, or try this Homemade Wrapping Paper using Colored Ice Pops by Happy Hooligans! Day 14: M&M Wreath Toddler Approved shares a simple, easy M&M wreath that kids from any age can create. Something to make and snack on at the same time? Genius! Day 15: Paper Cookie “Baking” Print out these Christmas Printables from Kids Activities Blog and sit down at the table with some glitter and glue and have a blast “baking” some fun Christmas cookies! Day 16: Minute to Win it Game Night Host a game night with your family, and invite some friends over too! This would be a great opportunity to utilize your blessing list and invite someone new to your home for some fun with your family. 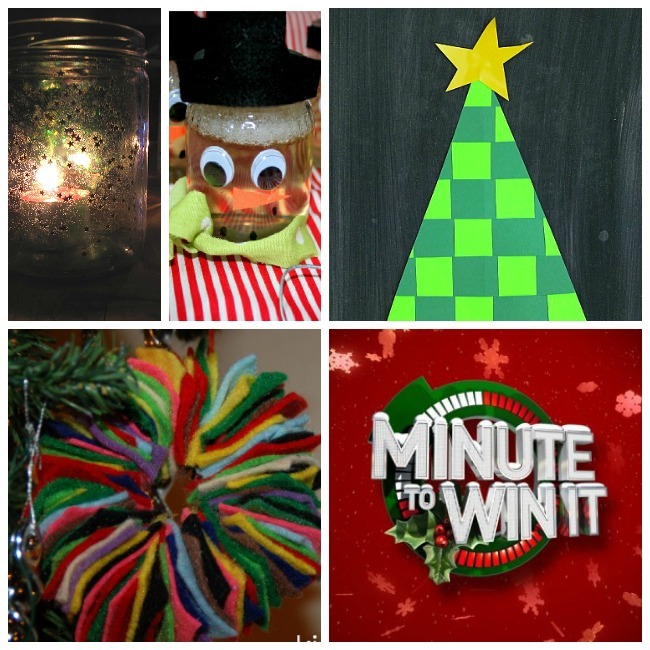 Happy Home Fairy shows you how to make this Christmas themed Minute to Win It a smashing success! Day 17: Starry Night Lights Create beautiful starry night lights like these from Powerful Mothering to light up your kids’ rooms (using batter operated candles of course!) or use them to line your steps for Santa’s arrival on Christmas Eve if you don’t have a fireplace for him to shimmy down! Day 18: Homemade Christmas Ornaments It’s time to craft some ornaments to adorn your own tree – or grandma and grandpa’s! 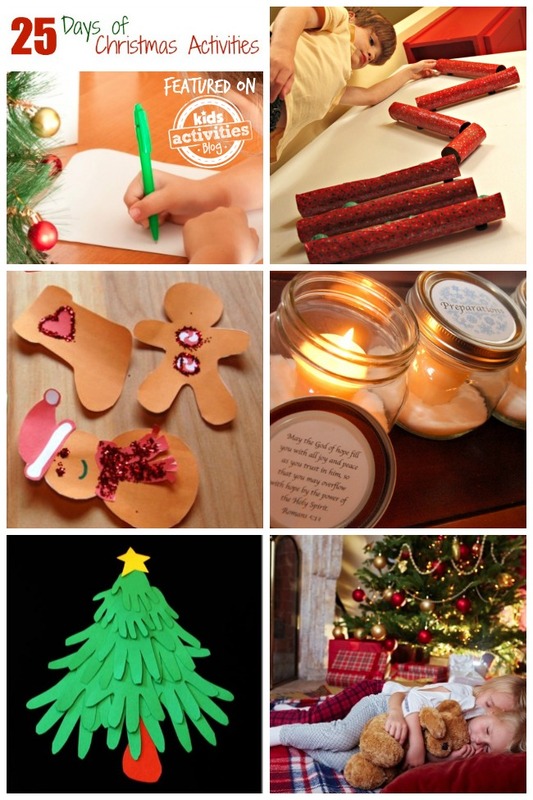 Kids Activities Blog shares 5 homemade Christmas ornament ideas that utilize craft items you probably already have in your home! Day 19: Woven Paper Christmas Tree This craft by Buggy and Buddy teaches kids how to weave paper and results in an adorable woven Christmas tree! Day 20: Snowman Bubble Jars Need some gifts for sweet friends? These DIY snowman bubbles in a jar by Inspired by Family Mag are adorable and your kids will love crafting gifts for their friends. Day 21: Donate Teach your kids the true spirit of giving this Christmas by donating food and/or volunteering at a local food bank. Day 22: Random Act of Kindness Stopping for a Starbucks while running errands? How about paying for the car behind you? Have a card ready that says, “Merry Christmas!” for the barista to hand to the recipient of your generosity. You could also do this at the Dollar Store or the grocery store too! Day 23: Bake Christmas Cookies Do you have some favorite Christmas cookies in your repertoire? Spend the day getting floured and sugared up in the kitchen today! After your cookies have cooled, place them on plates, cover them and tie them with a pretty bow. Hand deliver your plated treats as a family to people on your blessing list. Does your church offer a Christmas Eve or Christmas morning service? Attach an invite to the bow with the service details and offer to attend with your neighbors as well! Day 24: Sleepover under the Christmas Tree Everyone don their Christmas jammies (our kids get a new pair every Christmas Eve!) and pile the blankets, pillows and sleeping bags near the Christmas tree. Read the Night Before Christmas as a family and turn off every light except for the Christmas tree lights. Enjoy watching the kiddos fall asleep under the twinkling lights… and then get up and finish everything else that “Santa” needs to accomplish that night! Day 25: Christmas Morning Breakfast If you haven’t already, decide as a family what your traditional Christmas morning breakfast will be. In our home, it’s hot cocoa and Monkey Bread! You can also try this fabulous fun Christmas morning recipe; Christmas Tree Waffles or have multiple options with these 5 Breakfast Recipes for Christmas Morning. Traditions are a beautiful way to knit your family together and bring meaningful consistency to your celebrations. We read the Christmas story from the Bible (Luke 2) while we sip our hot cocoa and enjoy our yummy breakfast together. Only once everyone is done can the present mayhem begin! 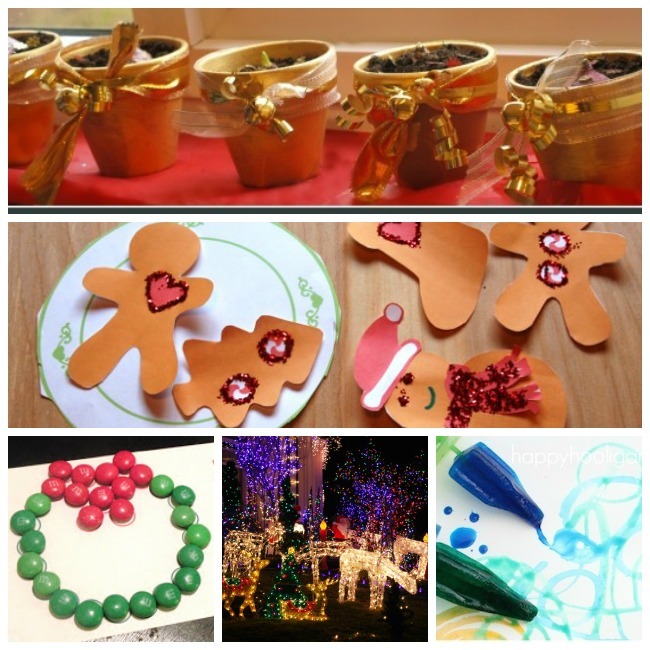 As you plan your Christmas season, I hope you will find these 25 Christmas Activities for Kids a useful gift in making special memories with your children. For more festive activity inspiration, head over to Facebook and become apart of the Kids Activities Blog community!